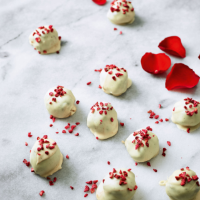 Using the ready-made cocoa-rich ganache cuts your preparation time, making these almond-flavoured chocolate truffles a doddle. 1. Gently melt the white chocolate in a bowl over a small pan of simmering water, then remove from the heat and leave to cool to room temperature. 2. Line a small baking sheet with baking parchment. Finely crush the biscuits into crumbs then mix with the ganache. Using two teaspoons, shape the mixture into 12 small balls and place on the parchment. Freeze for 15 minutes or so until firm. 3. Carefully roll each ball in the cooled white chocolate then place on the baking parchment. Sprinkle with the freeze-dried raspberries and leave to set. Keep in an airtight container in the fridge for up to 3 days.